Teampage streamlines the entire intelligence lifecycle, helping you make better decisions sooner. Teampage helps you collect content from all sources, including e-mail, web sites, news feeds, and business analytic systems. Intelligence teams can quickly classify, tag, and add commentary on any paragraph, directing stakeholders' attention to important details. Email alerts and daily digests keep stakeholders informed of critical developments, and let them quickly respond or request follow-up information. Teampage facilitates both automatic and manual collection of intelligence information. You can quickly capture and store the content of any web page, email message, or Office document. The Feed Reader lets you automatically ingest public and subscription newsfeeds. For time-licensed content, you can also set collected information to be deleted automatically when it expires. With tools from our partner Intuli, you can also monitor competitors' websites, regulatory databases, and other key data sources for changes, and have those changes automatically pushed to Teampage. Why is this important? What should we do about this? Who should follow-up, and how? Teampage lets you comment on, link to, and tag any paragraph to call out what's important about it. And when follow-up is required, tasks and events can be placed on a paragraph too. Your work as an intelligence professional is only as effective as your ability to get your analysis in front of the people who need it. 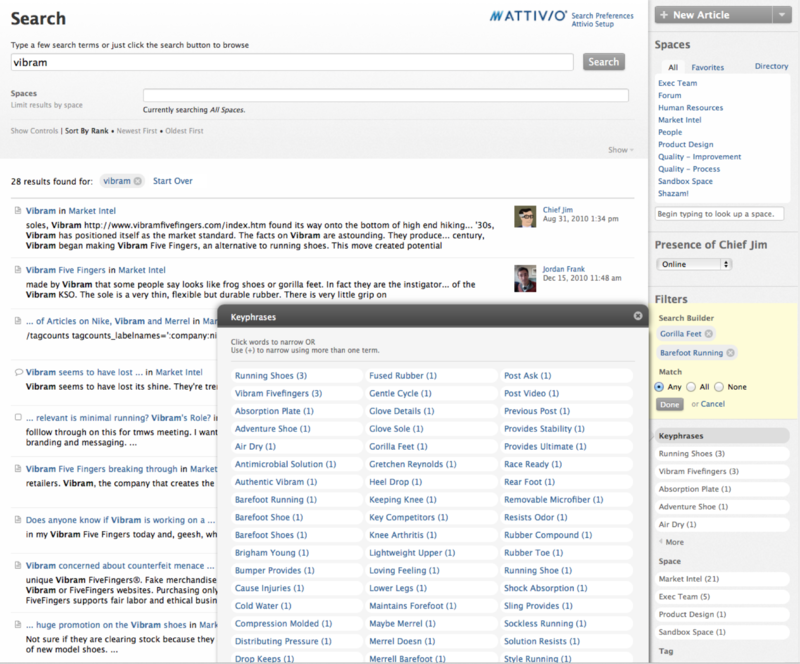 Automated email alerts and digests keep decisionmakers informed of critical activity. 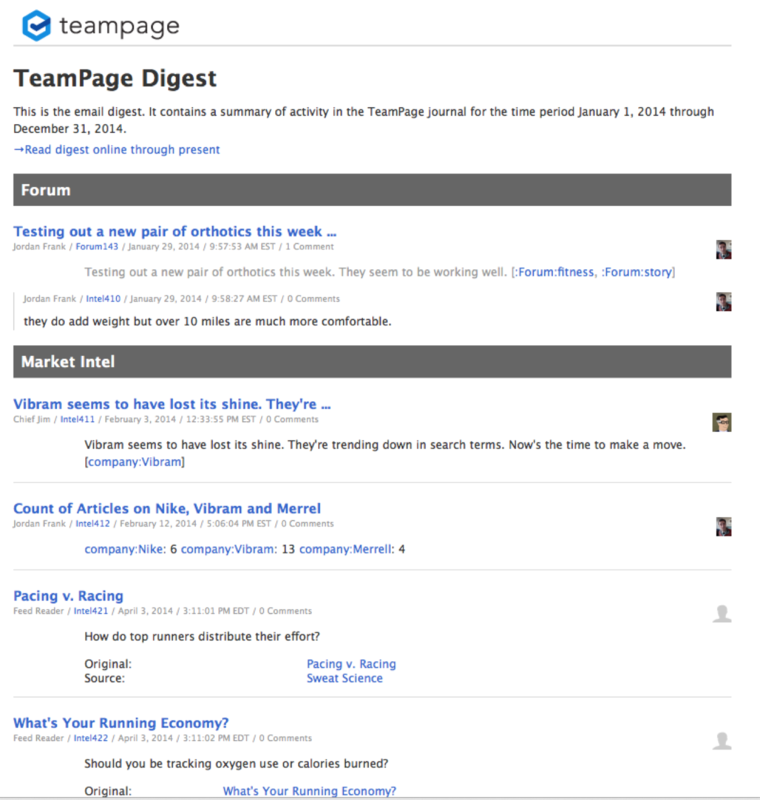 Teampage sends email digests automatically every day. Each person sees only what his or her interests specify and permissions allow. For example, a Product Manager may see competitive activity in her market area, while the CEO will also see the analysis and recommendations you post only for the executive team. And for information that can't wait, stakeholders can also subscribe to immediate email alerts that let them know right away when something important takes place. 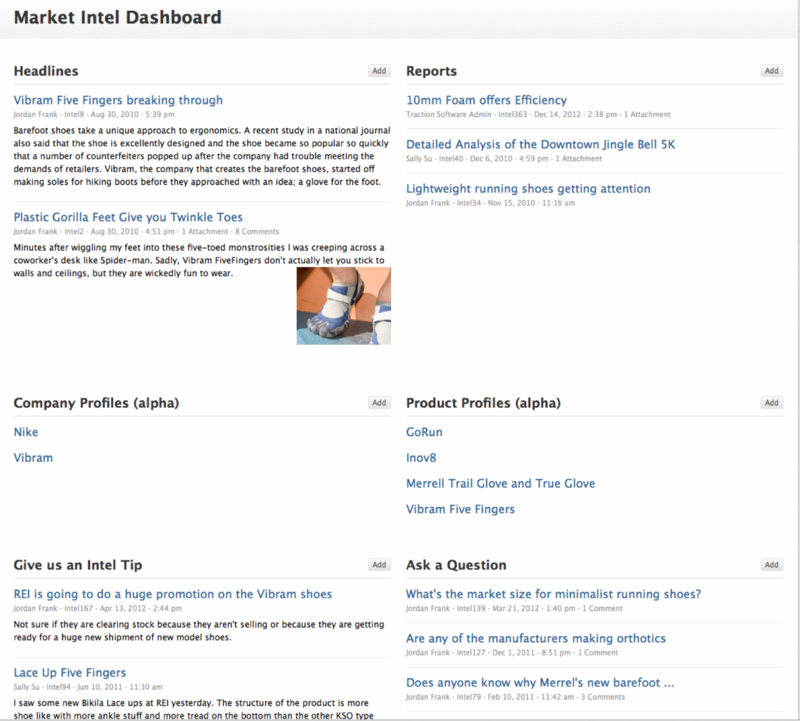 You put a lot of effort into gathering, annotating, and sharing competitive intelligence. However, competitive intelligence only becomes actionable organizational knowledge if stakeholders can find exactly the right information the moment they need it. Teampage's powerful search makes sure that the right information always falls immediately to hand. From simple queries to faceted drill-down to a search wizard that lets you construct powerful boolean queries, Teampage makes it easy to find exactly what you are looking for. And once you have a search query perfected, you can bookmark it, add it to a dashboard, or even subscribe to new hits via RSS. Read Thierry Barsalou, IPSEN CIO, Speaks at Gilbane Conference on Content Management for an abstract of Barsalou's speech and a link to his presentation. Fuld & Company's Intelligence Software Report 2008/2009 rated TeamPage's support for the Intelligence Cycle as Very Good or Excellent in four out of five stages of the intelligence cycle. The collective rank was better than the other 12 platforms in the report. Dark Blogs Case Study #1, A European Pharmaceutical Group - From Suw Charman, writer of the Strange Attractor blog on Corante:"I'm pleased to announce the arrival of the first Dark Blogs case study, examining the use of Traction's TeamPage enterprise weblog software for a competitive intelligence project within a large European pharmaceutical group. The case study examines the reasons why blogs where chosen, project planning, implementation, integration with other business systems, editorial process, launch and promotion, training and adoption." 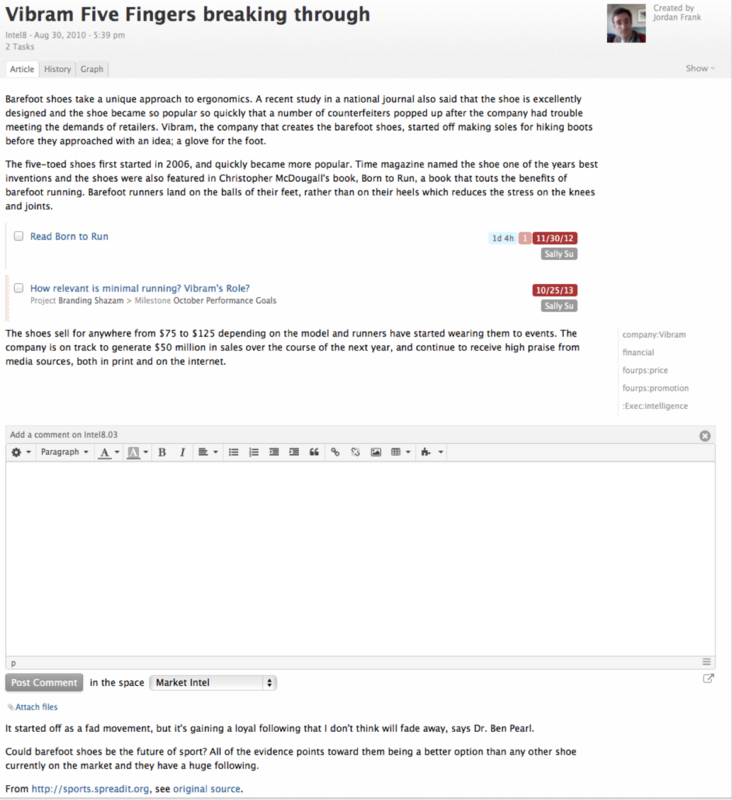 Blogging the competition, Weblogs take center stage in CI - There are blogging applications, such as Traction Software, that are built with the business user in mind. Use of Weblogs for Competitive Intelligence is Greg Lloyd's keynote presentation and paper at the The First International Conference/​Workshop on Business, Technology and Competitive Intelligence , Toyko October 25, 2005. En Guarde, The Art and Practice of CI was published in the January/​February 2005 issue of SCIP's Competitive Intelligence Magazine .​ Key quote: "The swordsman must be trained to find the right balance of source information and interpret that information into actionable intelligence.​ This article challenges the CI community to explore the grey zone of CI to develop skills and determine where ethical boundaries lie.​"
Compete more intelligently with TeamPage.